Four days before Janis Joplin’s death on October 4, 1970, she did an interview with Howard Smith of the Village Voice in which Smith did what a lot of male journalists tend to do when talking to a successful woman artist, rely heavily on leading questions that pits woman against woman. 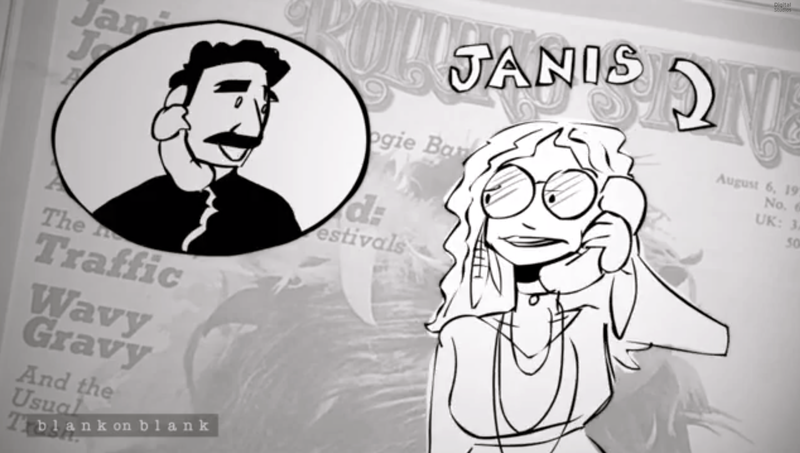 And while I do get tired of how often this topic is brought up incessantly in the media as fodder for the masses, it is rather interesting to see the interview animated for the PBS web-series Blank on Blank, even if it does leave one feeling regretful for Joplin’s untimely demise, especially in light of the guarded vulnerability she conveys to Smith, and all she might have accomplished musically. Oh and next time male music journalists, maybe you can skip all the anti-woman crap and stick to the music.